Settled at the turn of the 18th century at the confluence of the North and South Rivers, the village of Port Republic is an historic landmark in Rockingham County. What makes the village a great place to live? If you were to return to Port Republic in 20 years, what would you hope to see? The workshops gave community members the opportunity to define the features that distinguish the Port Republic area and to determine how their area should grow and still retain the special character of the place. 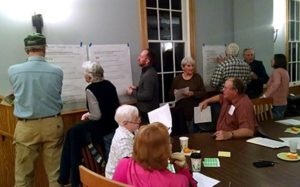 Participants also considered how to implement the community’s vision for its future. Rockingham County had recently created a new zoning district, the Rural Village Business District, for small communities like Port Republic. The outcome of these Port Republic planning workshops are informing the County’s planning and implementation of the new zoning district. We hope that it will also be used as a model for community planning in Rockingham’s other rural villages. In 50 years, Port Republic is thriving with much the same community spirit and extraordinary sense of place we enjoy today. Our greatest resource, our residents, value and protect the Port’s remarkable heritage – the historic village and adjacent gateway, the North and South Rivers that form the South Fork of the Shenandoah, the Port Republic Civil War battlefield and the surrounding farms and landscape. We provide for our community’s needs through enhancements that are compatible with this vision and our rural heritage. We welcome visitors to enjoy our history and learn from our efforts to plan for a future that does not erase the past.